Pickles are a sweet yet salty, crunchy, healthy snack! How are pickles healthy you ask? Your gut is home to many different strains of bacteria, both good and bad. There’s plenty of data that shows that eating fermented foods regularly, helps balance these bacteria, and in turn support the health of your immune system. If it’s as simple as eating sauerkraut, pickles or kimchi, I say why not? I liked this pickle recipe because it has a super healthy spice- turmeric. Turmeric has powerful anti-inflammatory properties. 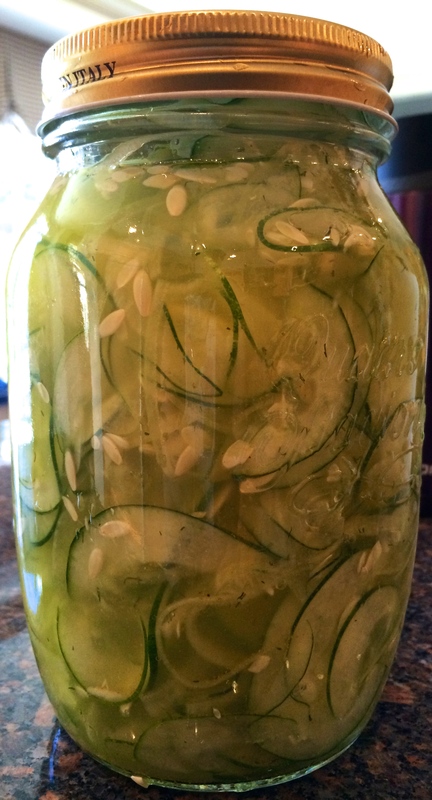 All that being said, these pickles are delicious and super easy to make. It takes the full 7 days for them to ferment. Enjoy! Combine the water, vinegar, sugar and salt in a small pot and bring to a boil. Stir until the sugar is completely dissolved and remove from the heat. Cool to room temperature. Mix the onion, garlic, mustard seeds, turmeric, dill seeds and cucumbers together in a large bowl. When the vinegar mixture has cooled off, pour it over the cucumbers and stir well to combine. Transfer the pickles to a (very clean) 1-quart glass jar and allow them to ferment in the refrigerator for at least 1 week. They will keep for a few months.